right now i am reading 3 books. One of the most remarkable one is Autobiography of a Yogi (1946) by Paramhansa Yogananda. this is a great book where a great hindu yogi has written detailed account of his life and his association with many of india's God realized masters. 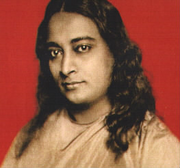 Yogananda is one of the preeminent spiritual figure of modern age. first time the life of yogi Paramhansa Yogananda captured my attention when i read about his death. it was a living testimony of his saintly status when weeks after his death, his unchanged face and body shone with divine luster of incorruptibility. he died in LA, USA in a state of mahasamadhi (a yogis final conscious exit from the body) on 7 march, 1952 after concluding a speech. The great world teacher demonstrated the value of yoga (scientific technique for God-realization) not only in life but in death and beyond. i quote from the book, Mr. Harry T. Rowe, Mortuary Director of Forest Lawn Memorial-Park, LA, writes, "The absence of any visual signs of decay in the dead body of Paramhansa Yogananda offers the most extra ordinary experience ... no physical disintegration was visible in his body even after twenty days after death ... no indication of mold was visible on his skin, and no visible dessication took place in bodily tissue. This state of perfection preservation of a body, so far as we know from mortuary annals, an unparalleled one ..."
the bodies of saints and prophet are known not to get decayed after death. its a sign of God. Yogi Paramhansa Yogananda is one of such friend of God whose life is so fascinating that it continues to declare the glory of God even after death. May God send his blessings, peace and love to the great saint. its interesting to note that Paramhansa Yogananda was the first great master of india to live in the west for more than thirty years. his realization of God was truly remarkable. Such a great soul comes on earth only rarely, when there is a real need among men. in this book, he described his meetings with other great saints, yogis and personalities. meeting with the catholic mystic, Therese Neumann was an incredible description of miracle to read. :: you may read the full book online from here. Quotes | "Self Realization is the knowing - in body, mind and soul - that we are one with the omnipresence of God; that we do not have to pray that it come to us, that we are not merely near it at all times, but that God's omnipresence is our omnipresence; that we are just as much a part of Him now as we ever will be. All we have to do is improve our knowing"